OK, so goats aren’t the most social creatures. I’m horribly socially awkward and just plain old terrible at making friends. I have a few who like to run, but JT up and moved to Seattle so that she can be the next Dr. Steamy McDreamy whatever, and Swim Bike Mom hates trails and lives far away outside the Perimeter and has children to look after and triathlon dreams to chase. Pooky ESQ, well, he detests running, and would prefer to watch movie of the month re-runs on HBO while working on Saturdays (which is good I guess…someone has to make the money while I’m out galloping around)…. Little E lives in Disgusta and is about to ship off to an exotic locale again…plus his job keeps him plenty busy with little time for my torturous weekend endeavors (also he knows how nuts I am and knows to be weary of events I invite him to). So that just leaves little old me to go out and run to my heart’s content. At first I felt awkward (well more awkward than I do on a daily basis) attending races alone…but I’ve grown used to it. But I have to admit the few races I’ve dragged JT, Little E, Swim Bike Mom, Carol B, or the Jamaican Sensation to – well, they’ve been more fun! Back to the race. So I went it alone. I ran this race last year and didn’t really recall anything special about it. I really wasn’t feeling it the morning of and honestly almost bailed. I think I may have been burning myself out on training or I was just tired. Pooky ESQ was getting ready to launch two new versions of his pocketbook on Georgia law – for a total of three this year! – so we were having a book release party the following Tuesday. My momma, Miss Bev or Mother George as Pooky refers to her or “Mo” as Little E & I do. So Mo flew in Friday afternoon. We shopped for party supplies and feasted at our favorite Lebanese restaurant, Mezza. Mo decided to stay home Saturday morning and work on party stuff while I ran. So I drug myself to the race. It felt chilly – I don’t know how I’m going to deal with winter if I can’t deal with high 50s on fall mornings. I still went with the tank top and shorts and was glad I did because as usual, I was sweating like a pig after a slow warm up job. 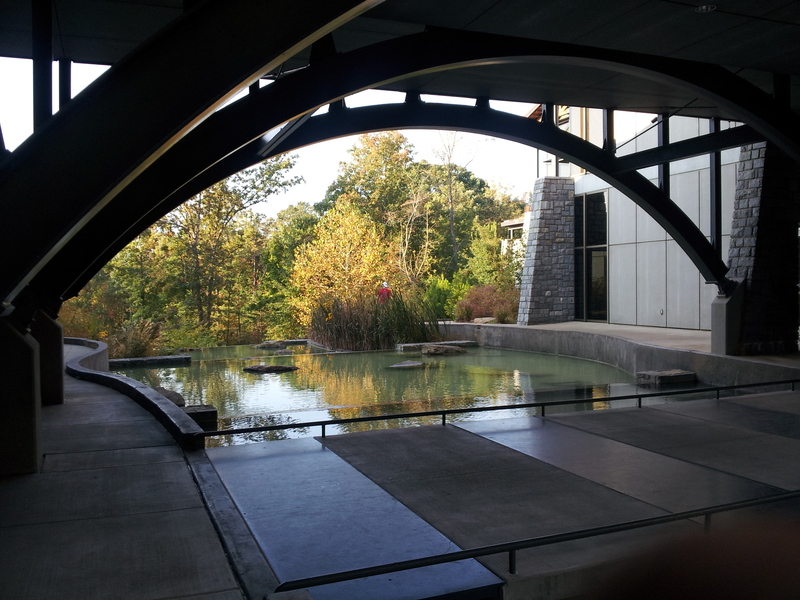 Don’t know if you’ve ever been to the Gwinnett Environmental and Heritage Center, but it is beautiful! They have all these plants and water and landscaping. I love it. Isn’t it awesome? Great scenery. I started the race up front, trying to go out as fast as I could. I chased the girl who always wins, knowing I wouldn’t even make it a mile with her. Eventually the pack spread out and I was about the 3rd woman. This is when the fun began. This course was a lot rougher than I remembered!!! Lots of hills and lots of crazy steep down hills which were plenty full of rocks, roots and other obstacles courtesy of mother nature. It was fun to dance, hop and skip the rocks and roots, but tricky as I am a little rusty. Me huffing and puffing and blowing no one’s house down. Mo noted that if my thighs get any stronger, they won’t fit into my clothes. I took this as a delightful compliment. I eventually got passed and was in 4th. I tried to push to get my third place spot back, but the hills killed me. I usually love a good hill and love to climb in the morning (shout out to Coach Monster! )…but I was NOT lovin’ this. I just gutted it out to the finish. So this one did beat me for reals. About the finish…so I get to the finish. I glance behind, with maybe a quarter mile left, and see the next girl a little ways behind me. I figure I’m ok and kick it in moderately. 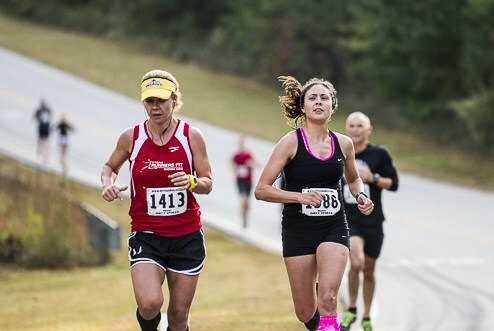 As soon as I cross the finish line, I see her right behind me. She was right on my tail and I didn’t even notice! 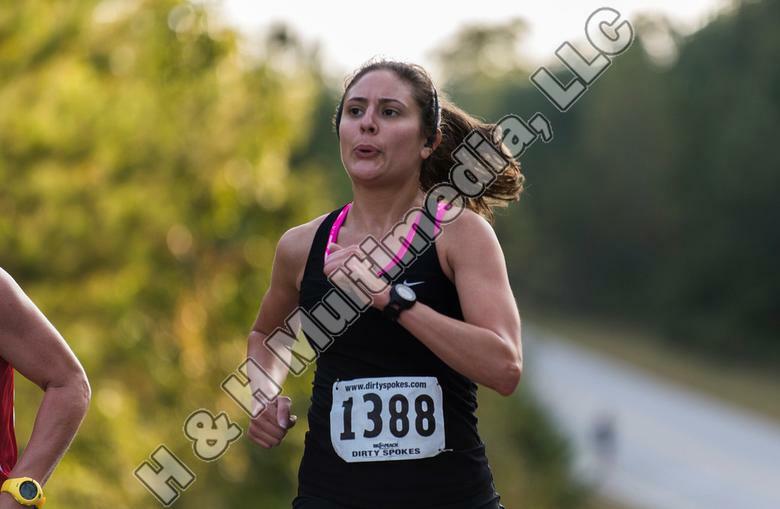 Luckily she didn’t catch me at the finish. We exchanged the usual “good jobs” and I went on my way to do as many cool down miles as I could as I knew I wouldn’t be hitting the gym afterwards so I could go shopping with Mo. It wasn’t a stellar performance, but not bad considering the course, at 23:40 something I think (I know, who doesn’t look up their exact time for a race report?!) 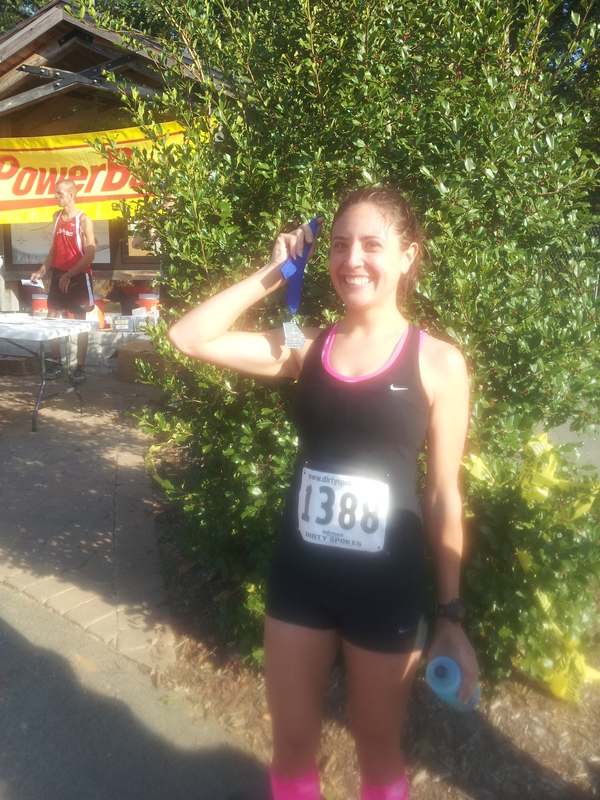 and 4th place woman, 1st place age group. Hello Crazy Eyes and Double Chin. The awards came and I waited and waited. 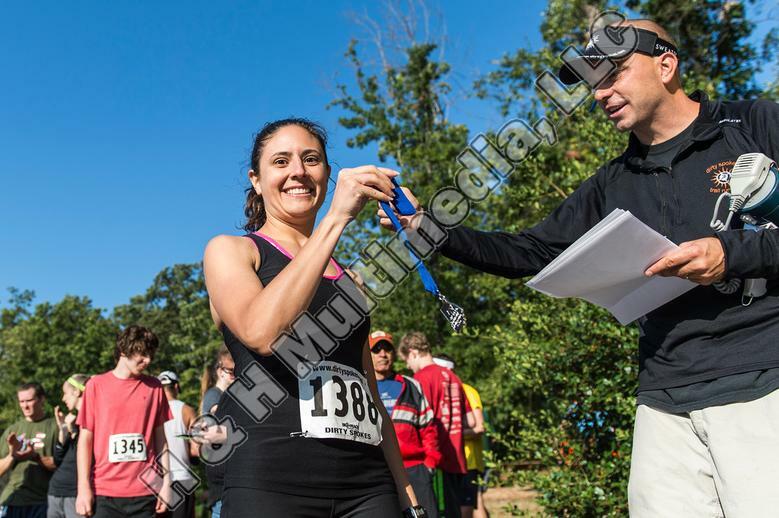 I wanted to ask someone to take a cute picture of me getting my award with Tim (the race director), but I was too chicken (that social anxiety again!) 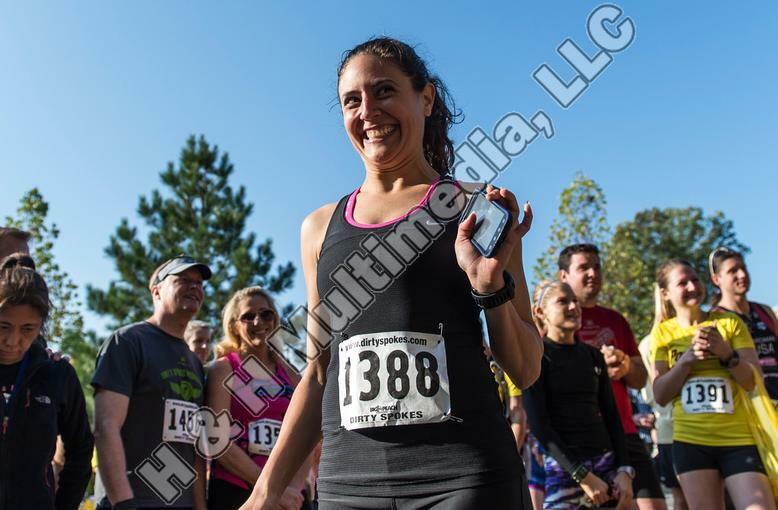 So instead, what I got is this weird awkward award photo the race photographer took. I think this could win a Swim Bike Mom ugly race photo contest. So they called my name for the awards and called me for 2ndplace. I didn’t think it was right, but walked up anyways. The girl who had finished behind me spoke up that she thought I beat her. They asked me and I said I didn’t recall (I don’t know why I said that, I did recall, and I recalled beating her!!! )…it was very awkward and embarrassing, especially for an already awkward and embarrassing person. OK, much better from the back sans crazy eyes and double chin. Me being my passive aggressive self and accepting the 2nd place award without speaking up. The race director told us we could exchange awards if we thought it appropriate. The other girl said nothing more of it and neither did I. It was an awkward moment for both of us, so we let it pass. This isn’t the Olympics or even an overall win…it wasn’t going to make or break anything, so that was that. I drove home, showered up and me and Mo went for a fun shopping trip. Got some dresses for my best friend from law school’s wedding in Vegas (more on the Mexican Texan to come!) and I forced Mo to have a veggie plate at Seasons 52 for lunch. 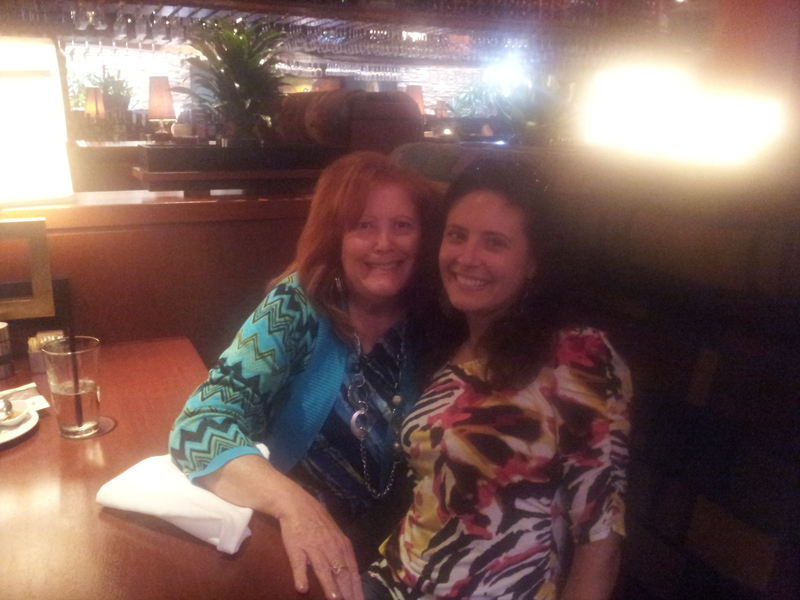 Me and Mo after our veggie plates at Seasons 52. Camera still doing the weird fuzzy thing. During the shopping trip, I noted my ankle felt kind of stiff and it wouldn’t crack like usual. We had been on our feet the whole day. 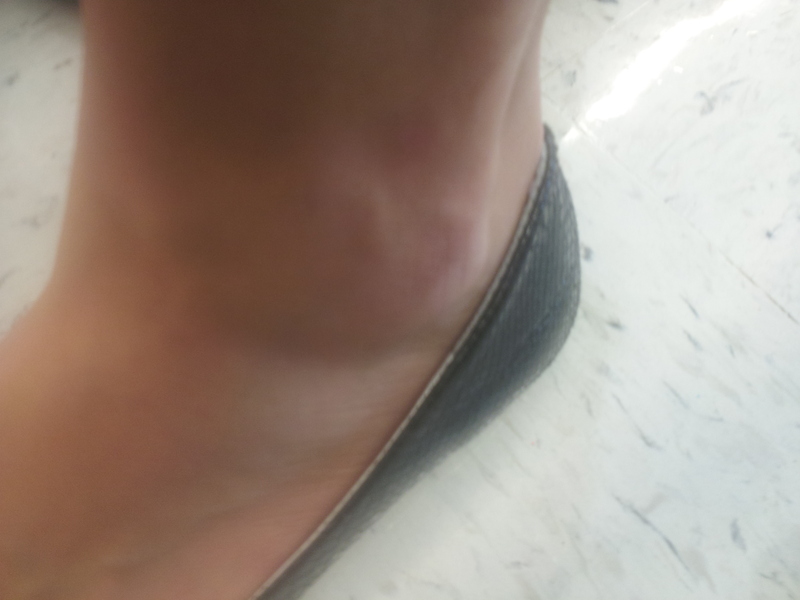 I lifted my pant leg and realized my stupid ankle was all swelled!!! But, we kept on trucking, buying party supplies and eventually meeting up with Pooky ESQ for a good old Camelli’s dinner. We were waited on my our favorite waiter/Shah Law Firm intern, Counsel. If I was a good blogger, I’d have a picture of counsel or Camelli’s here, but I’m not, so I don’t. Oh, later that day, I got an email from the super awesome race director, Tim, who told me he went back to the manual records and saw that I was the winner of my age group. He updated the records and points standing (Xterra series is a points system by race). And all was right in the world again. More double chins, crazy eyes, and super RD, Tim! 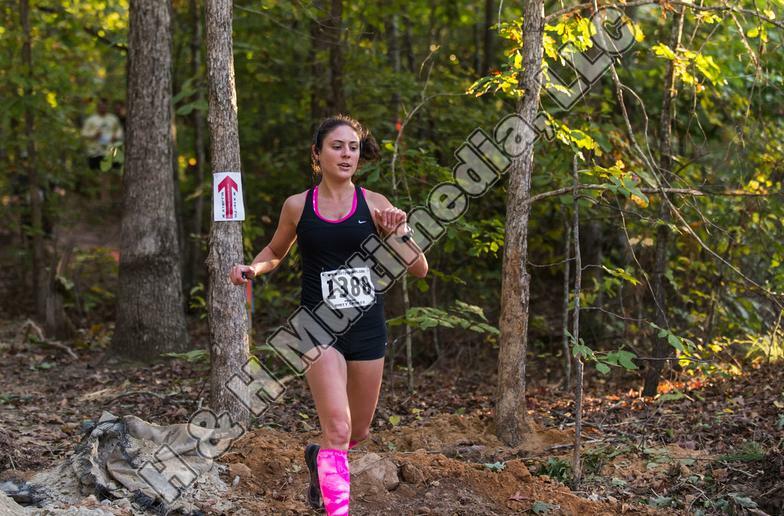 Until we race again….Happy trails! Good looking out with the shout out. I will be sure to attend more races to get more press. Great Blog Liz! Even if you do, and I say this very loosly, have a double chin … ain’t nothin else on you fluffy! Skinny girl. Awesome, welcome!!! Hope you like it! I’m no SBM, but I’m working on it. Great blog by the way!!! Love reading your reports! Working on a decent format for mine. You ROCK!! Mo totally enjoyed this latest adventure of my little mountain goat..thank goodness the thigh thing was a compliment…I guess Mother goat is a bit jealous….have you seen my thighs! LOL Mother Goat – thanks for all your help and for the compliment on the thighs. The stronger the better! Love you! There is nothing socially awkward about your awesomeness! Everyone should have a little bit of Liz in their lives to keep things interesting! Love your stories – you are a great inspiration! Thanks Big Al! Miss you. Come run with me!